The plant is mainly cultivated for the roots. These are used for cooking, but also have medicinal purposes. The dried or fresh root of the ginger plant. Powder, extract, tincture, capsules and oils, up to 2 g in three divided doses per day or up to 4 cups of tea daily. Decreases joint pain and reduces inflammation in people with OA and RA. Increases circulation in people with Ray­naud's phenomenon. Ginger contains active ingredients that may have analgesic and anti-inflammatory properties. Ginger reduces nausea and vomiting and is a proven treatment for motion sickness and chemotherapy-induced nausea. 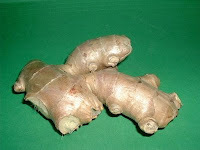 A recent study showed that ginger extract inhibited inflammation-causing chemicals, including TNF-α and COX-2. A 2005 study reinforced the anti-inflammatory effects of ginger. Another 2005 study showed ginger killed Helicobacter pylori, a bacterium that causes stomach ulcers. Ginger can interfere with medications for blood thinning. It should not be used if you have gallstones. Ginger is also used as a remedie for dyspepsia, colic and diarrhea, and to disguise the taste of medicine. It has cholesterol lowering properties that may make it useful for treating heart disease. You may already use it in the kitchen, to spice up a dish, but you can also make tea from the roots, simply by boiling them in water. If you prefer, you can add either honey, or lemon to it. The tea is commonly used to treat colds. Ginger beer and ale are commonly known to settle the stomach. Before using fresh ginger for cooking, be sure to peel it. To keep the 'fresh' ginger fresh, wrap it tightly in a towel and put it in a plastic bag. This way it stays fresh in the fridge for about 3 weeks and up to 3 months in the freezer. There are some negative effects to ginger as well. It can cause heartburn, bloating, gas, belching and nausea, particularly if taken in powdered form. Unchewed fresh ginger may result in intestinal blockage, and individuals who have had ulcers, inflammatory bowel disease, or blocked intestines, may react badly to large quantities of fresh ginger. Since the plant can grow up to 4 feet high, it can be blown over and broken by the wind. The roots are anchored deeply in the ground though and will sprout again. We too can be broken by the winds of life. With our roots having a good foundation, God provides all we need, to sprout again.
' Thus it was beautiful in greatness and in the length of its branches, Because its roots reached to abundant waters. Thanks sis and the same to you! I'll visit soon, it is long overdue! and blessings on you ... may your Christmas be joyful! Wishing you all the best this Christmas and a blessed New Year! Thank you so much, girl and we pray the same for you and yours!!! Corry, thank you so much for all the prayers, and KC's phone call to Gordon. It meant so much. This is the first day I have been around in a little while. I actually posted a short one. :) You have been a wonderful friend to us. Thanks for it all. I am praying for you and your dear family as well. Blessings. You are most welcome and we were grateful to hear Gordon was doing okay. May God bless and grant him a full and quick recovery. Happy New Year and God's Grace.